At the beginning you should focus on resources. Just click the village overview and choose a field out of the 18 resource fields (lumber, clay, iron and crop). Finally, click “Upgrade to level 1”. Later in the game you'll have the option to build more advanced buildings. These are listed when you click an empty spot in your village. Resources are the basis of your village; you need them for simply everything. In Travian there is lumber, clay, iron and crop. You can see your resource fields at the village overview. Each village has 18. The first village always has 4 woodcutters, 4 clay pits, 4 iron mines and 6 croplands but other lands around your village may have other distributions. Directly beneath this is a link where you can give the order to upgrade the tile. You can cancel this command by clicking the red X ( ) at the village overview, but you'll lose resources! In the village centre you can see a number of building sites. Each can only be occupied by one building at a time. Normally you can use any building site for any building but there are two exceptions; the rally point and the wall. Furthermore every building except the cranny, the warehouse and the granary can only be built once per village. These three exceptions can be built as many as you like per village after you build at least one of them to the maximum level. The buildings have different uses which are of a political, economic or militaristic nature. In addition you have to fulfil certain prerequisites for each building before you can build them. What those prerequisites are can be seen at the building page or the building tree. Be careful with the red X ( ), you won't get the costs fully refunded after cancelling a construction order! A complete and clear diagram of all buildings and their prerequisites is shown below. Click it to view it completely. The marketplace needs a warehouse level 1 and a granary level 1! Buildings and fields are two of the most important aspects of the game. They can enable you to build troops, store resources, join alliances and get resources. Lumber The Teutons as a tribe have troops of which training requires a lot of lumber. The residence costs a lot of lumber to upgrade. Clay Clay is the primary resource for the Gallic tribe, which has very clay-expensive troops. Also, an actively developing village needs relatively more clay. Iron This resource is mainly used in the expensive armour of the Roman troops and walls. Because of this, Romans will always be hungry for Iron. Crop The most troubling of the four resources. Buildings cost less crop than the other resources and you have 6 Croplands instead of 4, but you still do not have enough. This is because the crop production is lowered every time you upgrade buildings/fields or train troops. To upgrade a field, click the image of it and click the ";upgrade to level X" link. If this link is inactive, it should display the reason why. Of course you have to adapt your resource production to your needs, this is just a general rule. 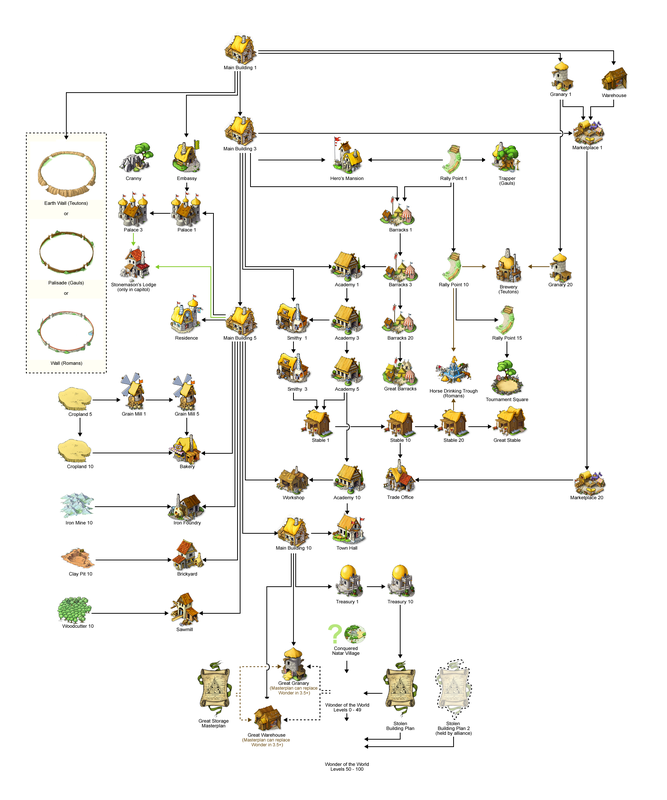 The buildings in Travian enable you to do anything but produce resources, which is what the fields do. To construct a building you should click an empty building spot in the village centre, which can be found by clicking on the second circle up in your Travian screen. After clicking the building site simply select the building you want in the list of available buildings. Some buildings require other buildings to be built as a prerequisite. Take a look at the Answers page about the building or the building tree to find the required prerequisites for a building. The most important buildings are listed below. The granary and warehouse store produced resources for later use. The warehouse stores lumber, clay and iron while the granary stores only crop. Later in the game you cannot keep developing unless you have these buildings and they are also prerequisites for buildings such as the marketplace. The main building, also called the MB, is the most important building in Travian. Almost all buildings require a main building level X to be built and upgrading your main building also speeds up the upgrading progress of your fields and buildings. From level 10 you can also demolish buildings from the Main Building. The military buildings enable you to train, upgrade and command an army. The most important of them are the rally point and the barracks. Take a look at the "Military buildings" main page. Below is a list of the other important military buildings. Walls: The city wall, palisade and earth wall protect your villages against attackers, giving a bonus of 3, 2.5 or 2 % per level. Additional the basic defensive value for a village will increase by 6, 8 or 10 defensive points per level. Upgrades: The Smithy increase the defensive and offensive skills of your troops. Hero's Mansion and Oases: As you can see when looking at the map, there are several valleys that are inhabited by animals. You can capture these oases with your hero to gain some extra production. Speed: When you start doing long range attacks you'll notice that most troops lack the speed required. When you build a tournament square, your troops become faster after travelling 20 squares. The secondary industries are buildings giving a bonus on the resource production of a certain kind of field. Each resource has its own secondary industry, and crop even has a tertiary industry. Lumber: The sawmill saws all the rough wood coming from the woodcutters increasing the production by a maximum of 25%. Requires a level 10 woodcutter. Clay: The brickyard processes all clay to bricks, increasing the production by a maximum of 25%. Requires a level 10 clay pit. Iron: The iron foundry makes iron blocks out of the rough iron ore from the mines, increasing the production by a maximum of 25%. Requires a level 10 iron mine. Crop: The grain mill processes the raw crops to grain, increasing your production by up to 25%. This requires a level 5 cropland. When you have upgraded it to level 5 and have a level 10 cropland you can build the bakery which adds another 25%. As your first village grows larger and larger, you'll eventually have to start new villages. This can be done by training Settlers. The Settlers can be built when you have a free village slot, which becomes available when you have a palace level 10, 15 or 20 or residence level 10 or 20. You'll always have unequal amounts of resources when you are actively playing. To solve this, you can trade with other players using the marketplace. Later in the game you'll need larger merchants, which can be achieved by building the trade office.